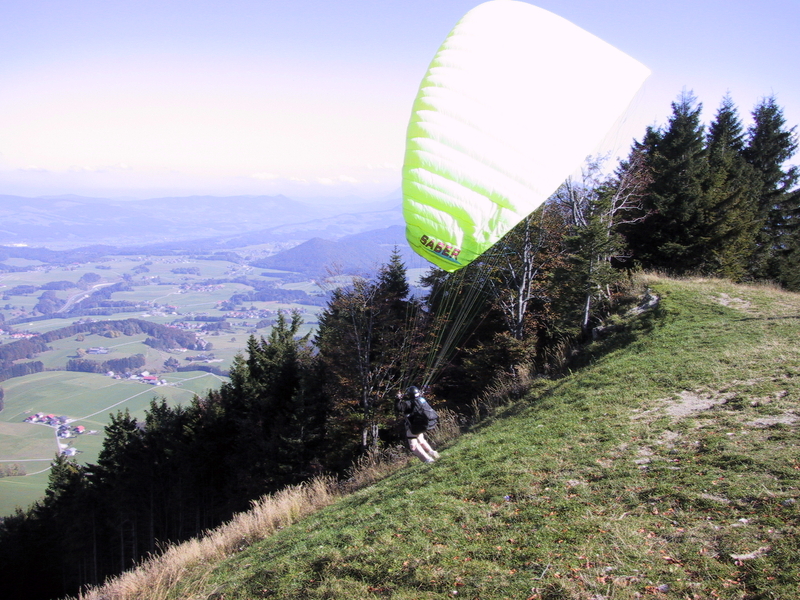 Flying and Teaching Paragliding have become synonymous with my life. I am Jeff Greenbaum and my flying enthusiasm started in 1984 with Hang Gliding. By 1986, I was teaching and had found flying was the love of my life. In 1988 I purchased the Hang Gliding school that I was teaching for and renamed it Airtime of San Francisco. Below are my membership cards for both Hang Gliding and Paragliding. In 1984, I was running the Windsurfing school for San Francisco Windsports (A school that taught both Hang Gliding and Windsurfing). By 1986 I had earned Hang Gliding Instructor rating. In 1988 I purchased the Hang Gliding half of the San Francisco Windsports business and renamed it Airtime of San Francisco. Shortly after this, in 1988, Paragliding was first introduced to me. I quickly took to this amazing new form of flying. A Paraglider is an aircraft that can fly as high and free as a Hang Glider, but fits in a backpack and eliminates the hassle factor. Airtime was the first school in the San Francisco Bay Area to offer Paragliding Lessons as well as one of the first Hang Gliding schools in the country to begin a program with Paragliding. With Paragliding, you can literally set up your wing, put on your harness and be ready to fly in about 5 minutes. The flying experience in a Paraglider is unreal when you consider the dreamlike flying, convenience and ease of operation. Airtime uses a Yahoo Group called Airtime-Pilots to track events and lesson scheduling. Please join the group if you would like to view the Yahoo Calendar and receive emails to the entire group of students and graduates of the program. I am an Advanced Paragliding Instructor. I am a Tandem Clinic Administrator and an Instructor Certification Clinic Administrator. This means that I have been appointed by the USHPA to administrate clinics teaching aspiring advanced pilots how to become Tandem Instructors and teach aspiring pilots how to teach paragliding. Over 3000 hrs. of combined Hang Gliding and Paragliding airtime and over 400 hrs. with passengers. 5 years of Windsurfing Instruction, 2 years of skiing instruction, 5 years of Hang Gliding Instruction, 27 years of Paragliding Instruction !! I have done flights with my own mother, and my own children when they were as young as 4 years old. I have taken a 90 Year Old Passenger tandem. I have taken passengers as large as 275 lbs. I have flown with my dog Zoe. In all of the tandem flights, I have a perfect passenger safety record. The glider I fly Tandem in is the Ozone “Magnum 2 Lite”. It is certified to 220 Kilos (About 490 lbs.). Currently, I do all of the Instruction for the school end of the business and have a staff of Certified and Excellent Tandem Instructors. Airtime of San Francisco offers Instruction, Tours, and Tandem Flight Lessons. A Paraglider is a parafoil wing that looks like a parachute, but flies like a hang glider. 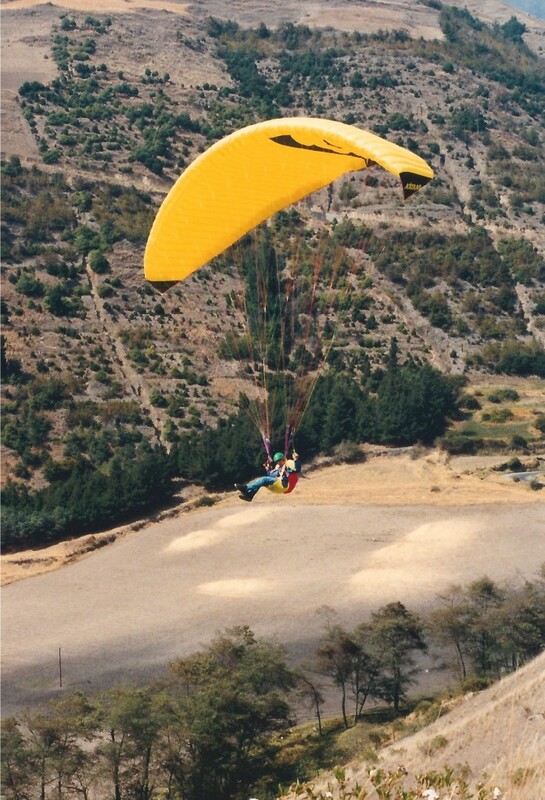 Paragliders launch like a large kite, and once in the air, glide and soar like a conventional Hang Glider. Steering is done through control lines like a ram air parachute. Tandem Paragliding is flying in a Paraglider built for two people. The pilot and passenger fly front and back, with the pilot in the rear. Tandem flights are a great way to experience the thrill of flying in a Paraglider. Passengers can even take the controls in the flight and learn about flying a Paraglider throughout the flight. The harness is extremely comfortable and the low flying speed of a Paraglider makes takeoffs and landings gentle and slow. In August 1996, the Outdoor writer for the San Francisco Chronicle, Paul McHugh, wrote a full page article describing his experience in a flight I took him on. To read the article, click here. I also offer complete instruction in paragliding. In these lessons, everything from basic launches and landings to ridge soaring and thermal flying are taught. I provide the equipment for the students and the training sites are in the general area of Pacifica. Please see the rates page for complete details on lessons. Flying a Paraglider is the closest you can come to the flights you have had in your dreams. The experience is something that words can barely describe. Picture yourself seated, comfortable and gliding gracefully above scenic cliffs. There is a light breeze in your face and freedom in your grasp. You smile because you sense that having this much fun is almost cheating the world.